So today in the office we are testing some new developments with the software set to roll out in the near future. I am going to briefly explain the first set of work which has been done and show you some sneak previews of what agency accounts are set to look like soon. If you look at the image below you can see a new button known as “landlord accounts” has been added to the system. This feature update was developed due to new legislation laid out by the N.P.S.R.A (National Property Services Regulatory Authority) requiring increased regulation of monies collected and paid out to landlord clients. The new feature will allow agents to eliminate any errors made when taking in rental payments, adding the necessary deductions and forwarding payments to their landlords. Once a rent has been marked as paid, the landlord’s accounts page will automatically be updated to remind you of the money to then be paid/transferred to their account. For example look at the rent due below of €1400 on a property, normally this will be marked as paid and then I need to remember to forward on moneys owed to the landlord. With the new feature (see the image below) the system automatically updates the landlord’s accounts page reminding you of the outgoing payment that is due to your landlord and ensuring the entire process is managed efficiently with NO mistakes. Hope you look forward to the roll out of these new accounting features as we do and as always if you haven’t liked the Facebook page, do it now 🙂 and follow us on Twitter for more blogs and other great content. Thanks guys! Cloud computing systems – the answer is in the cloud! ‘A simple and more efficient way of buying and using technology‘. I will comment below on how it can specifically help your agency. licences being paid up front and its limitations. Through the use of an in-house cloud based system an agency can manage all its clients information in one easy to access location- from tenant references to landlord accounts and maintenance invoices you only need a wifi connection and your login! Great right? Services are delivered via the internet whether its accounts software or a customer relationship management system or an overall enterprise software package. A letting agent can also pick and choose to what suits them with most SAAS (software as a service) providers will only charge you for a package that suits you and on a monthly subscription basis. The speed at which you can operate your day to day running of the agency will drastically increase as you begin to automate re-occurring services or move them to the cloud rather than hard data. That’s it in a nutshell, the ability to transform your agency! Product Development Update- After listening to agencies through out the country we understand that a huge headache for agents is generating the invoices for fees to landlords. Whilst its great to have the ability to generate an invoice as it represents revenue it can sometimes be a pain to generate the invoice. Not anymore!! Now through Rentview you can generate an invoice for your agency in seconds, not only will the invoice be branded towards your agency but as always with Rentview’s Transparency it can be viewed on line for your landlords through their secure login via your agencies Sub domain. Rentview’s application will also pre-set your monthly management invoices for the period of the lease. All agency invoices which are generate are located in your agency account section and with one print off you can have your end of month, quarter or annual vat returns ready. Generating Agency Invoices with Rentview.com from Rentview on Vimeo. As always we would be happy to hear your feedback on this topic. Please feel free to comment, share , tweet etc. Summary: A brief look at how letting agents can reduce time and money spent on inventory reporting for landlords /tenants and reduce likelihood of disputes over deposit retention related to inventory condition. The role of inventory in property management: Inventory is a factor involved in any tenancy agreement, a tenant must be happy with the property contents and its condition throughout before entering into a tenancy agreement and a landlord must do same when ending the tenancy and returning the security deposit to the departing tenant. Problems that arise over Inventory in Property management: Often, a tenant and landlord or property manager may come into conflict over issues related to inventory, Irishlandlord.com writes ‘One of the most common areas of dispute between landlord and tenant relates to the contents of the property and its condition’, unfortunately the current practices for recording inventory of a property is extremely out dated and will prove very difficult to stand up in a legal dispute. 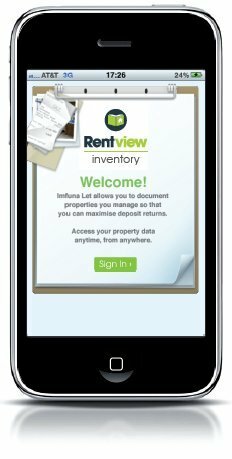 The Rentview Inventory App: Set to launch on the app and android stores in just over two weeks Rentview will set a new standard in the residential lettings market throughout Ireland for protecting both landlords , agents and tenants by using modern technology to provide detailed inventory reports that can be carried out on any Smart phone! This will save you valuable time and money as a property manager! But where does the info go and how will I protect us against claims? But wait that’s not all, current and future users of the Rentview property management software will be able to upload their reports (VIA The Cloud) onto their Rentview accounts for safe storage. Access can be shared with a landlord or tenant by agent. If either party have anything to add to the report they can do so and a copy is then printed before a tenancy commences signed by both tenant and property manager. About Rentview: Rentview is an internet based property management software solution designed by two former property managers with over 12 years experience in the Irish market. The software was developed to Manage, Build and Retain an agencies property portfolio, no matter what the size! Rentview Inventory only furthers our goals of saving property mangers hours of time per week, potential disputes with tenants and decreasing the overall costs associated with managing a property.